What Will You Create At The Chill Hill Vickery Village? 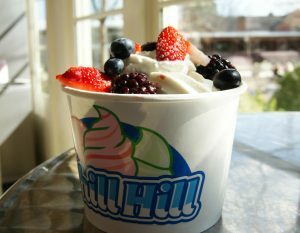 What Will You Create At The Chill Hill In Vickery Village? 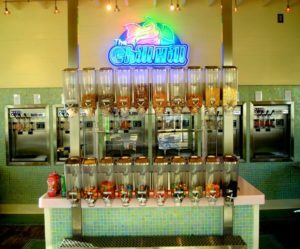 With 12 soft serve flavors and over 50 toppings the dessert options are endless at The Chill Hill Vickery Village! 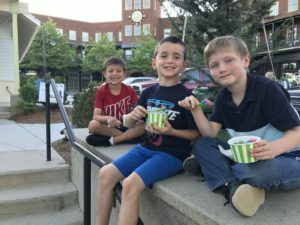 Placed right in the center of Vickery Village stands a locally owned and operated ice shop serving up big flavors and great service. You can choose to eat your dessert at the indoor or outdoor seating. Or you could be like my son and his friends who like to eat their creations on the wall by the stairs. LOL! 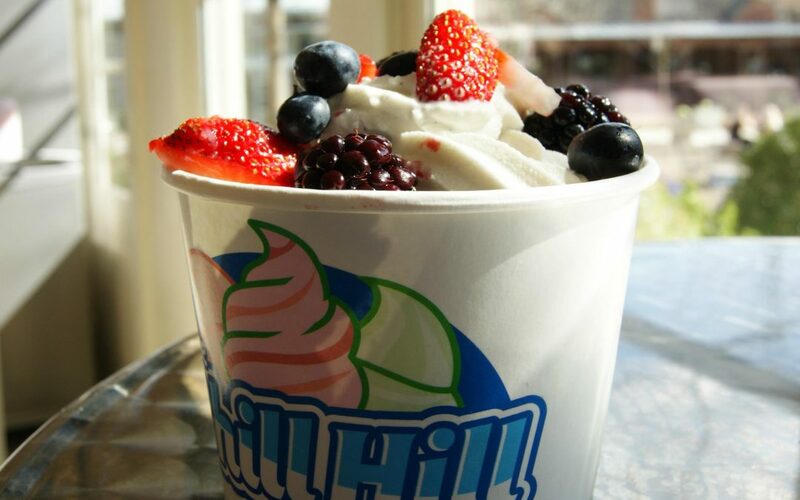 The Chill Hill offers some really fresh and delicious flavors of soft serve frozen yogurt like white chocolate mousse, vanilla custard, strawberry shortcake, birthday cake, sea salt pretzel & many others. They also feature different seasonal flavors throughout the year. Want some insider scoop? The Chill Hill will be offering a homemade peach and key lime pie soft serve this summer. Currently, they are offering a blackberry and a strawberry soft serve. I’d like to mix the strawberry and blackberry together and then top with some fresh fruit. Doesn’t that sound so refreshing on a hot summer day? As far as toppings goes there is literally everything you can think of from fresh fruit to all the different syrups to candy to cereals and everything else in between. With all of those topping choices you could definitely create something different each time you go. Did I mention the hot dog cart out front? It’s not just any type of hot dog. 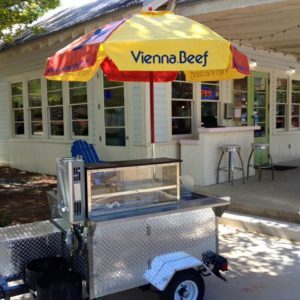 It’s Vienna Beef and they are really delicious! The hours for the cart fluctuate. TIP: Make sure you check their Facebook page for updated hot dog cart availability. Want some more insider information? 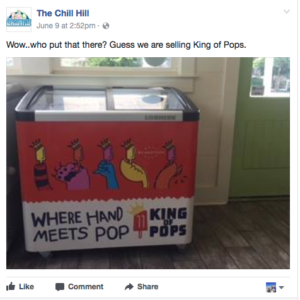 The Chill Hill is selling King of Pops this summer! If you have never tasted these delicious gourmet popsicles, I’m begging you to go to The Chill Hill and get one (or two). Some of our favorite flavors are Chocolate Sea Salt, Watermelon Mojito, and Coconut Lemongrass. 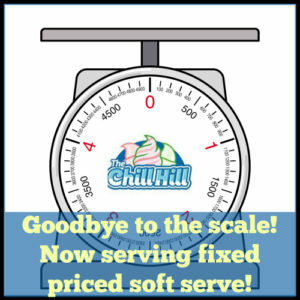 In case you haven’t heard, The Chill Hill said goodbye to their scale. They now charge for the soft serve by the cup size. That means you get a small, medium, or large cup and fill it up with frozen yogurt and the toppings to your desire. Then you know the price is fixed no matter the weight. To me this change just simplifies the process of getting soft serve frozen yogurt. I will also add that The Chill Hill sells hand-scooped ice cream as well. And they have around 26 flavors of hand-scooped ice cream. Some of our favorite flavors would be the chocolate chip cookie dough, strawberry, or rocky road. The pricing for that is simply by the scoop. 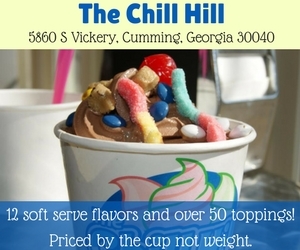 What Will You Create At The Chill Hill in Vickery Village Next Time You Go? There are FREE Outdoor Movies in the Park at Vickery Village this summer right in front of The Chill Hill. To see the schedule of the movies, click here.